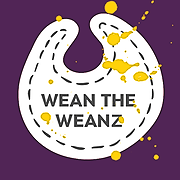 Wean the Weans began in Blackburn, West Lothian in 2008 as a project to provide information and practical support for healthy early feeding. It was co-ordinated by Blackburn Early Years Action Group and initially funded by Community Food and Health Scotland. The project included running weaning roadshows and courses, providing the basic skills, knowledge and equipment parents needed to make their own baby food. Some of the parents and staff involved in the project wished there had been a resource they could use which was easy to read and full of the answers to their questions so they decided to create one written by parents for other parents. Funding from West Lothian Council regeneration team and NHS Lothian Eatright Project allowed the project to continue and the Wean the Weans booklet was produced. Feedback from staff and parents and local research identified that parents would like a weaning mobile phone application. This application is based on the Wean the Weans booklet that is given to new mothers in West Lothian, Scotland. The information has been checked to ensure consistency with NHS Health Scotland weaning and early years publications, First Steps Nutrition Resources, and recent research.